"The femur's connected to the patella…" Reassemble the most complete skeleton then ship it off to a museum for display. 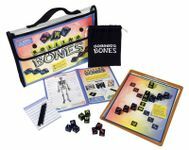 This game teaches the skeletal system using correct anatomy terms. Each player rolls the 18 dice on his or her turn and tries to complete as much of the skeleton as possible. You score points by completing and connecting to sections of the skeleton, and placing a skull allows you to earn more points. You must roll and place the Checkmark to end your turn and score any points for the round. You can try for a better score by re-rolling your dice, but each time you re-roll, it will cost you.